Puerto Ricans warm, dry, funny wearing disaster relief. 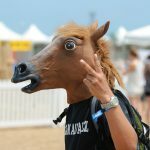 San Juan, Puerto Rico – After playfully tossing paper towel rolls to locals seriously affected by hurricane Irma, Donald Trump has seemingly permitted a shipment of latex horse masks to Puerto Rico. To the aid of the stricken comes a few dozen thousand goofy conversation starters, just in time for Halloween. Halloweenluiah! Domes will stay pretty dry and overly warm while suffering. The Red Cross is working their tails off to bring help and assistance to Puerto Rico while our aging Prez is dispatching flimsy headwear to the post-apocalyptic almost-a-state. Shoemaker then reiterated the fact that this was a shipping error and in no way was it a prank played on the kind-of-American island. Inadvertently hilarious disaster relief? You make the call. A final note: the Fake News name Serf Shoemaker can be joyfully re-arranged to formulate the phrase FREE HORSE MASK.